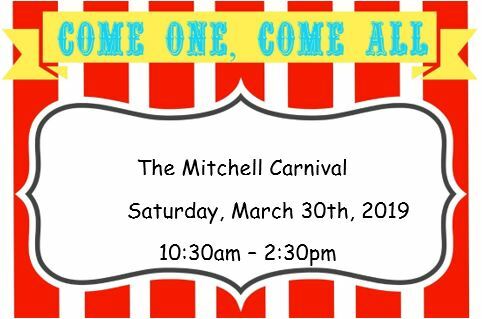 Please join us for the Mitchell Elementary Annual Spring Carnival. The day will be loaded with food, games, a Fun House, King of the Mountain, Bounce House Carousel and fun for the whole family! Contact Mike Newland at ways.means@mitchellpta.net or Kim Newland at fundraising@mitchellpta.net with questions. Purchase tickets online in advance through Tuesday, March 19th & SAVE! Click here for advance purchase. Tickets will be sent home with your child on Friday, March 29th. Tickets will be also available at the ticket booths during the Carnival. Cash and Credit Cards accepted. 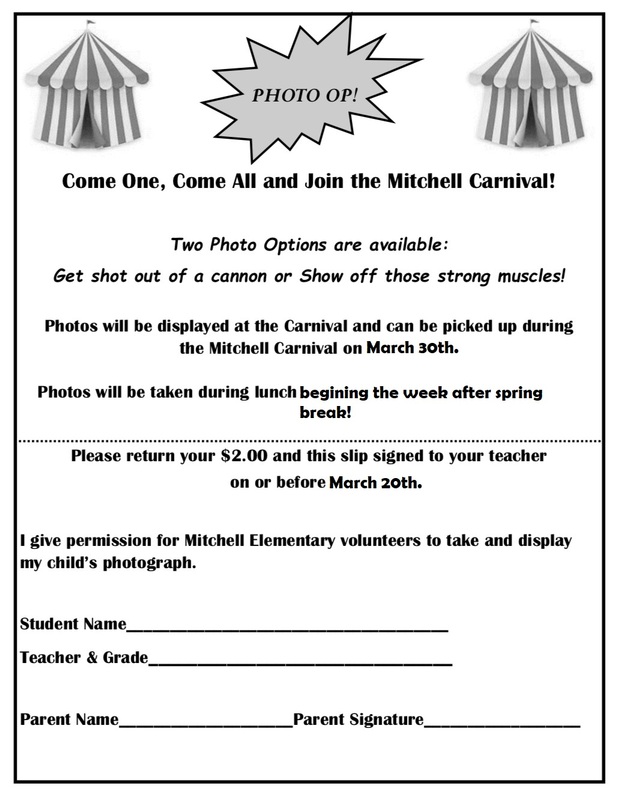 Photos will be displayed at the Carnival and can be picked up during the Mitchell Carnival on March 30th. Photos will be taken during lunch, dates TBD. Complete Photo-OP form and send to Mitchell with $2 per photo, due by Friday, 3/22. To ensure the Carnival runs smoothly and is loads of fun for our kids, we are in need of adult volunteers. Please consider working a 1-hour shift during setup on Friday, March 29th or during the Carnival on Saturday, March 30th. Click here to volunteer at the carnival! Baked Goods Needed for Silly Sweets! We are in need of store bought or homemade baked goods for our Silly Sweets goody booth at the carnival. (NO PEANUT PRODUCTS.) Cookies, brownies, rice crispy treats, muffins, cupcakes, cake pops, etc. Please pre-package 2-3 small items or 1 cupcake/muffin to a disposable baggie or container. There will be volunteers available to collect baked goods during drop-off March 27-29. Tightrope Cakewalk (NO PEANUT PRODUCTS): Simple homemade or store bought cakes. One layer cakes are great. 1 box of cake mix will make 2-3 small single layer cakes. Please bring cakes in disposable containers labeled with your child’s name and teacher. There will be volunteers available to collect cakes during drop-off March 27-29. Drink Donations: We need soda and bottled water for our Carnival Eats Food Court. Can soft drinks (any brand, regular or diet) and both large and small bottles of water would be appreciated. Please drop off your donations in the boxes located across from the office at the front of the school any time up until the week of the carnival.